Full Service Yarn Shop: The Continuing Adventures of Wanda plus New Yarn! Wanda did very well yesterday. There was a little bit of chewing but nothing really destructive. More like she was saying, “I got to be with you all last night and all this morning and now I’m stuck in here by myself! WTF?” We also did have a puddle on the floor but that’s just because she hasn’t gotten used to the routine and I haven’t figured out her signal for “I have to go out RIGHT NOW!” Brutus (my bullmastiff) used to have a certain whine that meant if he didn’t get outside in the next two minutes, it was going to be bad for all of us. Wanda got to meet her Auntie Michelle yesterday (as well as a bunch of other people). Auntie Chelle owns Pupperific dog walking service and is going to take Miss Wanda out with a selection of her clientele today to learn how to play with other dogs. And Auntie Chelle came bearing gifts. 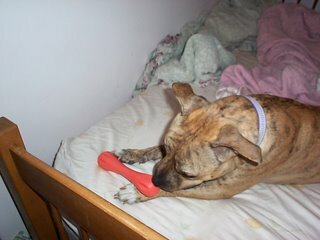 I am working on getting Wanda a bunch more toys, though this will do for a start. She only has this toy, a bone, a ball and, of course, the stick in the backyard has been doing yeoman service. Never fear. There will be many new toys coming soon! I really could keep blogging about the dog all day but there is more going on a Chez Full Service. It is late August in the yarn business and what does that mean? New yarn!! 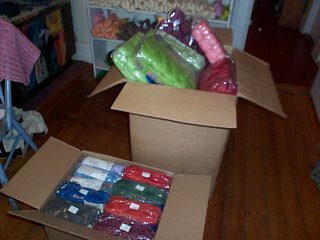 These two boxes came yesterday with a whole bunch of new yarns as well as new colors in the old yarn. I’m in the process if finding homes for it all. It is amazing how much yarn I can crowbar in here if I put my mind to it! 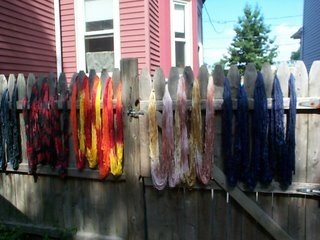 Also, here is the newly dyed yarn drying on the fence. I’m going to try to do a bit more tomorrow. I mostly wanted to get going on colors that people were looking forward to (Emily, I did your black and red. How many do you want?) I got a bunch of new dyes so I’ll be trying them out over the next few dye sessions. New dog, new yarn, new dye! I really am in heaven!! Wait is that me? Could there be another girl named Emily who mentioned that they were looking for red/burgandy and black yarn? I am in WI at the moment and can't get to the store before the beginning of August. I'm saving yarn for you, beating off the masses with a stick! It'll be here when you get here. Wanda is so adorable and has the friendliest look! Is she part pit bull? She's all pit bull. I think they called her a Staffordshire Terrier mix to try and get her adopted. I'm glad she's all pit. Staffies are 60-90lbs which is just too much dog for me now. Thank you so much for adopting Wanda! No thanks are needed. I'm pretty sure I'm the lucky one here! No, I am the Emily of the Red and Black yarn! However, there was some weird glitch with blogger, and I have not seen any of these posts until today. Bizarre. Wanda the Wunderful.. she is an absolute beauty. Thank you for opening your heart and home to her.